The National Flag is rectangular and is formed by two isosceles triangles, the bases of which are overlapping. One triangle is black and its height is equal to one-third of the length overlapped to the yellow triangle, whose height is equal to half the length of the Flag. In the centre of the black triangle there is a white star of five ends, meaning the light that guides. The white star has one of its ends turned towards the upper right end of the flag. The remaining part of the flag is red. 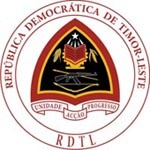 “Pátria” is the national anthem of the República Democrática de Timor-Leste. Composed in 1975 by Afonso de Araújo with words by Francisco Borja da Costa, “Pátria” was adopted with the Restoration of Independence in 2002, as the national anthem. The motto UNIDADE, ACÇÃO, PROGRESSO, (UNITY, ACTION, PROGRESS) represents the basic values of politics and moral underpinning the nation’s and people’s life.